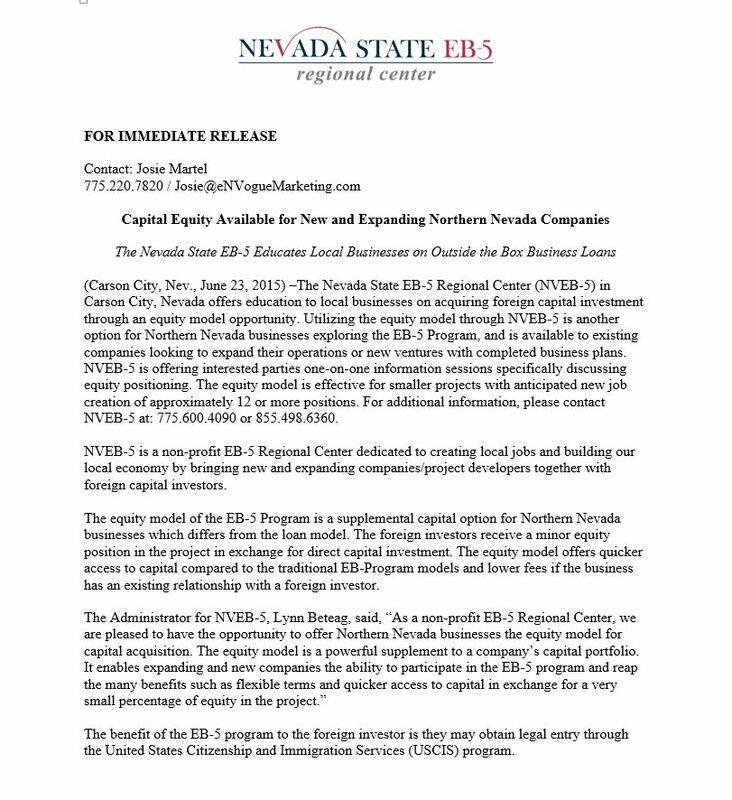 The Nevada State EB-5 Regional Center is offering Northern Nevada companies informational sessions on utilizing an equity model for their capital portfolio. Click or read the complete press release below. Is Northern Nevada the next Tech Mega Center? As the Northern Nevada region clears the carnage of the economic recession, it emerges stronger than ever. Once thought strictly as an entertainment capital, it is slowly blossoming into a technological power house. With the recent start of construction on the Tesla Gigafactory, other new technology companies are exploring the economic and quality of life benefits Northern Nevada has to offer. In addition to the construction of the new Tesla battery manufacturing plant east of Reno, other recognized companies are exploring the region including: Apple, Dairy Farmers of America, Amazon and the Switch Data Center to name a few. The recently announced Switch Data Center will provide cloud-based data backup for mega companies such as Ebay and Dreamworks. Currently, its only data center is located in Las Vegas and Switch looks to create a double redundancy system with the addition of the new Northern Nevada facility. Work has begun on the first phase of the $1Billion data center. Technology based companies/project developers rely heavily on capital to launch new operations, relocate or expand. A powerful tool available to these companies/project developers is the EB-5 Program. As a certified USCIS EB-5 Program, the Nevada State EB-5 Regional Center facilitates local job creation through foreign capital investment into local, approved projects. If you are a Technology based company or supplier interested in joining the Northern Nevada Tech World and require capital, please contact NVEB-5 to discuss how we can assist you. To learn more about the many benefits of becoming an approved EB-5 Program, contact The Nevada State EB-5 Regional Center at: 885.498.6360 or visit: NVEB5.org. https://www.nveb5.org/wp-content/uploads/2015/12/logo-with-space-2--300x98.png 0 0 Josie https://www.nveb5.org/wp-content/uploads/2015/12/logo-with-space-2--300x98.png Josie2015-06-11 14:33:392015-10-07 14:36:59Is Northern Nevada the next Tech Mega Center? We know that one of the major EB-5 Program benefits to Companies/Project Developers in the United States is to create jobs through Foreign Investment. But, how does the EB-5 Immigrant Investor Program benefit the Foreign Investor? 1. USCIS approval of a project offers a potential investor a level of security. 2. The added benefit of “in direct and induced employment creation” formulation for the EB-5 investor, assisting in meeting the job-creation requirement of an investment. 3. The passive investment-nature of the limited partnership role with the New Commercial Enterprise. The role of a limited partner satisfies the management requirement imposed by federal regulations, while simultaneously relieving the EB-5 investor of responsibility for day to day business operations. As a limited partner, the investor has limited policy-making involvement, yet no day-to-day management authority. Thus, for the vast majority of immigrant investors not interested in management of the business, the EB-5 Regional Center program offers the most attractive investment option. 4. Live anywhere in the US. Another advantage of the Regional Center program is that the investor is not required to live in the same geographic location as the investment. Rather, he or she can live anywhere in the United States.